Call it Sociology Light, but birth names and their incidence say something about a culture’s here and now, and its theres and thens; and a table of the 100 most prominent names conferred upon newborns in the UK, circa 1905, and lined up with a like array from 2012 must be at least halfway instructive, it seems to me. Once you relieve the boys headers of their wrap-text trammels (and note the odd typeface discrepancies up there as well; and I’d have formatted the Change field in percent style, lest readers think all those negative numbers communicate absolute values. You’ll note in this regard that a Change of -1 suggests a name-occurrence reduction of 100%, but in some cases this rounds off what is in fact something less than that), the names numbers prove downright interesting. Tack a simple sum formula to the base of the No. and Rate columns for both genders and we learn, among other things, that the 100 1905 names contributed 240,289 of all boys’ and 197,042 of all girls’ birth names, that year, compared to 2012’s 96,534 and 56,002 respective aggregates. The Rate sums (that is, the number of times the top-100 names appeared among every 1,000 births) for 1905 stand at a remarkable 508.14 and 431.73, meaning that the boys’ 100, at least, identified more than half of the male babies that year. By decided contrast, the 2012 figures came to 257.86 and 157.6. But then, we’re not comparing like for like. And that’s because like for like would require us to call in the top 100 names for 2012, a distribution furnished not at all by the data before us. 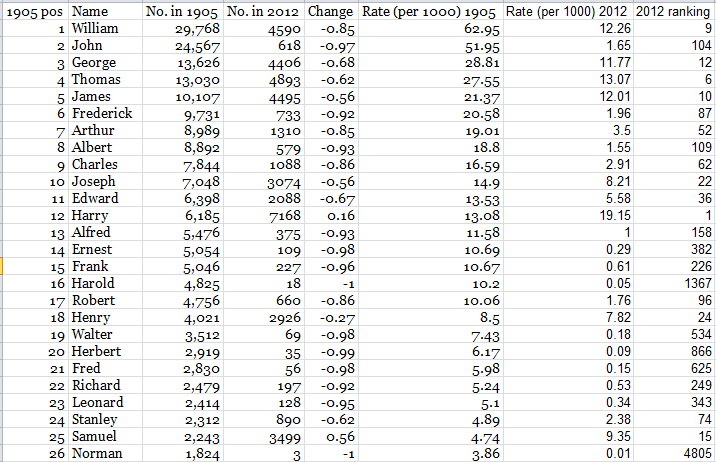 All we have here are the counts for the 2012 births of just those names that cracked the top 100 in 1905. We can, however, download the 2012 names for both genders here in separate workbooks, on that page’s second and third data links (use the names on Table 6 for both sets; these array the names down a solitary column and exhibit all the birth names bestowed upon at least three children, thus counting off a top 6,200 for boys, and over 7,700 names for girls. We’ll want to access all the names, for reasons I hope to justify shortly.) What these data, however, don’t afford us with is rate data, and only the absolute birth numbers; but as we can see, we should be able to draw the rate inferences nonetheless. So what do we want to do here? First, copy and paste the 2012 names (all of them, as I’ve advised) in distinct columns for both boys and girls into a new sheet in our workbook, and separate these by at least a few columns. Name the range of names (names only) for boys Boys, and for girls Girls (I’ve let my imagination run riot here). Then return to the original 1905 Boys sheet and divide the number of 2012 names for William in D1 by its rate in G1. The yield – 374.39 – can be adopted as a more-or-less constant, signifying the number of actual name-bearing births in 2012 accounting for 1 out of 1,000 births that year (more or less, because of a rounding off of the rate numbers down the column, I think). In other words, about 374 actual male births in 2012 compute to 1 per 1,000. Then alongside the most numerous name in the 2012 boys’ range – Harry – divide his 7,168 total by the 374.39 (presumably in the column to the right of the actual birth numbers). I get 19.15 (per 1,000); then copy down the column. Add the outcomes for 1 through 100 and I get 542.23- an even mightier hegemony for the top 100 boy names in 2012 than held for 1905. Move to the Girls range and try the same tack. I’m using a rate constant of 355 here, in the interests of again looking past the variation inflicted by rounding off. Dividing the girls’ names by the 355 and summing the rates, I get 444.83 – again, a heightened share for the 2012 top 100. And there’s something else we can do – we can go on to figure the 2012 rankings for the 1905 names. It works like this. First, and I’m sparing you the trial and error, it appears as if all the boys’ and girls’ names in their native Table 6 sheets in the 2012 workbooks have been set upon by an old nemesis – the superfluous space. Because we’ve already copied these names to that separate sheet in the 1905 workbook (to the ranges we’ve called Boys and Girls) apply the TRIM function (see the March 27 post, for example) there to some nearby columns, and Special Pasted > Values atop the original names. Then delete the column bearing the TRIM formulas. Norman, on the other hand, has plummeted from 26 to 4805 (note that many names in 2012 share the 4805 position; they’re the ones with three babies each). And now you can do the same for the girls (but be prepared for some #N/A messages, these pointing to those 1905 names which no tots in 2012 received, e.g., Gladys.) And there’s something about Mary – number one in 1905, down to 241 107 years later. So what’s in a name? Not much, perhaps; but names? Squint, and you can see the zeitgeist moving. Vacation time this coming week – Word Press is a most enlightened employer.